Today”s Daily Tip: Place items in the areas of your home where you’ll use them, to increase the chances that you’ll follow through. It is a new year. It is time to start fresh and bring natural healthcare back into the home. A great way to do that is to build your own natural medicine chest using herbs and oils so that you can treat common health issues that come up on a day to day basis. By using herbs and oils you are reducing your risk of drug interactions, liver damage and toxicity while giving the body what it needs to heal, not just masking symptoms. You are educating yourself and taking your health and the health of your family into your own hands. 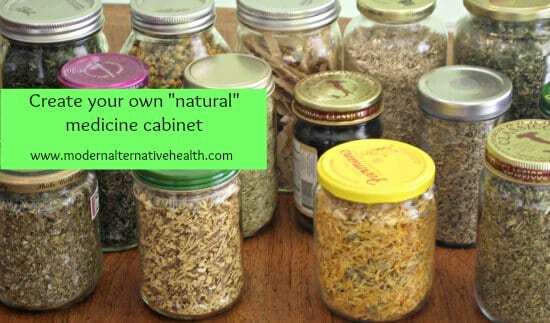 When building your natural medicine cabinet I encourage you to look for high-quality organic herbs, oils, tinctures, and herbal capsules that are from a trusted source. The remedies you chose should be safe for your lifestyle. Are you pregnant or breastfeeding? Be sure to check herbal safety from a trusted source like Susan Weed’s book “Wise Woman Herbal for the Childbearing Year”. Are you on any particular medications like blood pressure meds, anti-depressants or birth control? Some herbs can reduce the effectiveness of or interact with prescription medications. Be sure to check with a certified herbalist before adding herbal remedies to your daily life. That being said I tend to lean toward safer and nourishing solutions for my family. I find by taking care of and nourishing our bodies with real whole foods and herbs that we get sick much less often. I like to use nutritive herbs like nettle, red clover, or red raspberry on a daily basis to maintain health and vitality. How do I store herbs and herbal remedies? How long is their shelf life? Store dried herbs in a cool, dry, dark place. A glass mason jar with a tight lid or a brown paper bag in a cool dry place are both popular options depending on your climate. Herbs properly stored will generally be good for 1-2 years from the harvest date depending on if it is a fragile leaf or flower (1 year) or a root or bark (2 years). 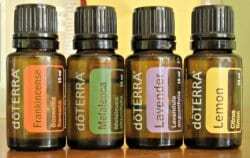 High quality essential oils will not go bad for many years (if at all) except for citrus essential oils. Citrus oils have a 1-2 year shelf life on average. Medicinal oils and infused oils have the shelf life of the oil used for the infusion. For example, Olive Oil has a 1 year shelf life so a good rule of thumb is 1 year from the date of your infusion the oil will expire. Herbal tinctures or alcohol-water extracts when stored properly in a brown bottle in a dark, cool, dry place can last from 2-3 years. Stinging Nettle: This herb is a vitamin powerhouse. It is high in iron, calcium, potassium, silicon, magnesium, manganese, zinc and chromium along with a host of other vitamins and minerals. Stinging nettle increases metabolic activity and strengthens and tones the entire system. It is useful for growing pains in young children, achy joints, and arthritis, reproductive health, alleviating PMS and menopause symptoms. Stinging nettle is strengthening to the genitourinary system including the kidneys. It is also indicated for liver problems or congestion and to treat allergies and hay fever. A daily infusion of this wonderful herb will help anyone maintain a healthy vibrant life. Plantain: This highly nutritious plant is a common weed across North America. It makes a wonderful poultice and pulls foreign objects from the skin. It is great to use for blood poisoning externally as a poultice or internally as a tea. Plantain is one of my go-to skin herbs for its soothing and healing properties and is effective against eczema and psoriasis. It is also used to treat liver sluggishness and inflammation of the digestive tract. Calendula: Great for healing the body and promoting cellular repair. It is antiseptic and commonly used externally for bruises, burns, sores, skin ulcers, eczema, psoriasis. It is also used internally for gastrointestinal issues and is wonderful for healing the stomach lining. Calendula can be taken in a tea for fevers, cramps, indigestion, diarrhea and leaky gut. It also promotes lymphatic movement. Peppermint: Refreshing and rejuvenating. Peppermint is commonly used as a digestive aid to soothe upset stomachs. It is effective for easing nausea and stomach cramps. Ginger: Wonderful for the reproductive, respiratory and digestive systems. It helps improve poor circulation and is wonderful for cramps. Peppermint is effective against morning sickness and motion sickness. It opens up pores and promotes sweating. Peppermint is anti-inflammatory, antiviral and anti-fungal. It helps improves digestion and helps the body effectively remove waste. Yarrow: Yarrow is an amazing healing herb. It is anti-viral and bacterial. It is diaphoretic , increasing sweating and reducing fevers. Yarrow is a great herb to have on hand when you are camping, hunting and fishing as the powder of the herb, or just a chewed wad of the flower applied directly to a cut will disinfect a cut and stop bleeding. It also stops bleeding internally and is effective for menstrual and stomach cramps. Yarrow is very bitter and should be combined with other herbs for palatability when used in a tea or herbal infusion. Elderberry and Elder Flower: Elder flowers are wonder for colds, flus, upper respiratory infections and fevers. Elder has immune-enhancing properties and makes a potent, safe and effective tea when combined with Echinacea. Elderberries support and increase immune function. They have antibacterial and antiviral properties and add a nice flavor to teas, jams, jellies, cordials and more. Echinacea purpurea (the other species are over harvested and in danger of becoming extinct): This is an amazing immune system booster. It is incredibly effective and is not known to build up in the body. Echinacea purpurea is best used at the first sign of illness to increase macrophage activity in the body and help naturally fight infection. It is generally safe for pregnant woman and children to use. Red Raspberry Leaf: A highly nourishing reproductive tonic that provides nutrients that tone and strengthen the entire genitourinary system. It is one of the richest plant sources of iron and is used to replenish the body’s iron stores combined with nettle. Red raspberry leaf is rich in niacin and manganese supporting healthy connective tissue and energy metabolism. It is used to treat diarrhea and dysentery. It reduces menstrual cramps and is a super tonic for pregnancy and child birth. Red Clover: A potent detoxification herb and respiratory tonic. It is used for easing chest complaints such as coughs, colds and bronchitis. Red clover is rich in minerals like calcium, nitrogen and iron making it a wonderful herb to drink as an infusion daily. It is used for skin conditions and is an excellent detoxifier and blood purifier. Oat Straw: One of the best nervous system tonics and an effective cardio-vascular tonic. This is a calming and restoring herb. Wonderful for people who are anxious, stressed, depressed, overworked or overwhelmed. It helps repair damage to the myelin sheath which protects nerve fibers. It is highly nutritious containing silica, calcium, chromium and is one of the highest terrestrial sources of magnesium. Lavender: Lavender is an analgesic, antidepressant, antifungal, anti-histamine, anti-inflammatory, antiseptic, regenerative and sedative. We use it as a first line of defense for skin issues, to calm and soothe the kids when they are hyper, for anxiety, burns, diaper rash and so much more. Peppermint: is analgesic, antibacterial, anti-carcinogenic, anti-inflammatory, antiseptic, antispasmodic, antiviral and invigorating. It is my go to oil for headaches, muscle aches, respiratory issues, stomach issues, and when I need an energy boost. It is known to increase alertness, reduce asthma symptoms, for use with asthma, cold sores, congestion, constipation, cramps, diarrhea, heart burn, hives, hypothyroidism, indigestion, itching, overheating, migraines, sciatica, throat infection, vomiting and so much more. *CAUTION* Peppermint used in large enough doses can cause a decrease in breast milk production. I only see this if I take it internally but I wanted to warn the nursing moms out there to watch and see how this effects your milk production. Melaleuca (tea tree oil): is analgesic, antibacterial, anti-fungal anti-inflammatory, antiviral, a decongestant, expectorant, immune stimulant, insecticidal, and tissue regenerative. We use it for skin issues, acne, lice, cancer sores, infections, cleaning the house, eczema and dermatitis, nail and fungal infection, thrush, and so much more. This is definitely a must have oil. Oregano: is a very strong anti-bacterial, anti-fungal anti-parasitic, antiseptic, antiviral and immune stimulator. I consider oregano “The big guns” and brake it out to stop an infection in its tracks. Oregano is a very hot oil and can be caustic to the skin so use it well diluted with a carrier oil on the bottom of the feet. Frankincense: Anticatarrhal, anticancer, antidepressant, anti-infectious, anti-inflammatory, antiseptic, antitumor, expectorant, immune stimulant and sedative. I use Frankincense oil every single day to help with my chronic inflammatory issues and pain management. I use it instead of over the counter drugs and can not tell you how wonderful this oil truly is. It can be used for alzheimer’s disease, arthritis, asthma, to balance the body, for brain aging and injury, breathing, cancer, concussion, confusion, coughs, depression, fibroids, immune system support, infected wounds, inflammation, memory, mental fatigue, moles, MRSA, PPD, ulcers, tissue regeneration, warts and wrinkles. It is wonderful for the immune system, nervous system and the skin. This is the oil I am never without. 80-100 proof alcohol for making tinctures or glycerin (or both). These herbs and oils are a great starting point to be more self sufficient to take your healthcare into your own hands with natural remedies. Some books I recommend that can get you started on your healing journey are “Rosemary Gladstar”s Medicinal Herbs: A Beginner”s Guide: 33 Healing Herbs to Know, Grow, and Use”, “The Herbal Medicine Makers Handbook” by Jason Green, “Herbal Antibiotics: Natural Alternatives for Treating Drug-Resistant Bacteria” by Stephen Harrod Buhner. I hope this provides you with a good starting point to building your own medicine cabinet this year. I encourage you to start small with one or two herbs and oils and get to know them before moving on to more complex herbs. You will find that having the power to care for your self and your family without over the counter drugs or going to the doctor for every little sniffle will empower you and enrich your life. What herbs are your must-haves in your medicine cabinet? This is a great post! Until about a month ago I only had a couple herbs on hand. Then I used some of our Christmas budget and chose 4-5 recipes from this site to try. I stocked up on about 20 different herbs for those recipes and have used them in multiple preparations: a pregnancy tea, hard lotion bars (which I don’t know how I lived without before), elderberry syrup, a kid-calm tea, a soothing bath tea for itchy skin, a healing hand salve. The herbs I’ve found myself using most frequently include the herbs in the pregnancy tea that I like (red raspberry leaf, oatstraw, nettle and peppermint or spearmint), as well as calendula (for skin soothing), chamomile (for skin soothing and for teas). 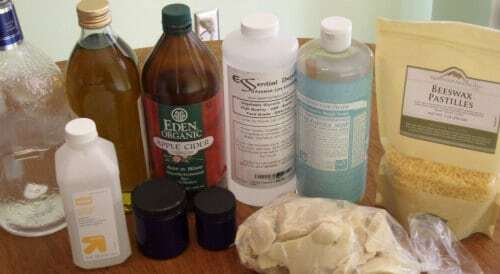 Non-herbal items I find to be super helpful include calcium bentonite clay (for itchy skin, digestive issues and homemade tooth powder), cocoa butter (for skin–what a delicious scent) and Epsom salts (for a soothing bath with a dose of magnesium). Again, thank you for a great post!! Great post! Off to see which of those I can grow myself in zone 7. Still have a few things I want to get from this post.Thanks. This is so great! Thanks so much for such an informative post! I’ve been needing someone to just tell me what to do for awhile. Great to have all this compiled in one post. Yes. That is pretty worthy. I always dream of building up my own medecine cabinet. And I guess it will be always indispensable to have it at home. I bookmarked it up. Thanks! You are one of my favorite blogs…”Modern Alternative..” BUT YOUR BANNER ADS DRIVE ME NUTS! (Don’t like doing the capital letters thing but feel it needs to be said.) Up, down , UPPPP, Down…!!! Please stop it. Banners all the same size. This post was a wonderful and much-needed resource for any momma out there looking to change her over-the-counter medicine cabinet into a natural one. Herbs and oils are wonderful things! But what about homeopathic remedies? When considering natural substances that offer superb healing benefits with no side effects it’s important to consider homeopathic treatments as well. Herbs and oils must be handled at times with caution and sometimes take a little time to facilitate healing, but remedies can cause no harm and are quick and easy to use… even in conjunction with herbs and some oils. Once you throw these into the mix you would have a very efficient, complete medicine/first aid cabinet! Thanks for all the information you provided, Amanda! This is really great information to bad I didn’t read that yarrow tastes really bad before chewing it up to put on a cut!! Enjoying your site. Just an FYI…Wasn’t sure if you had place the link for the online casino in the Red Raspberry Leaf info, it didn’t seem like something your site would have promoted.